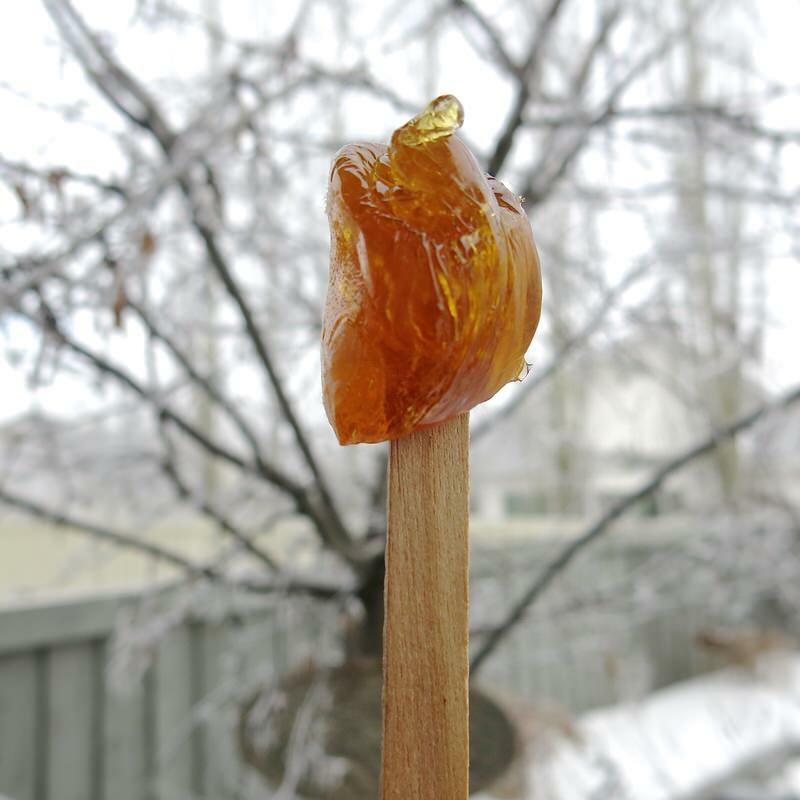 Canadian Maple Syrup Taffy Candy: Learn how to make it yourself at home! 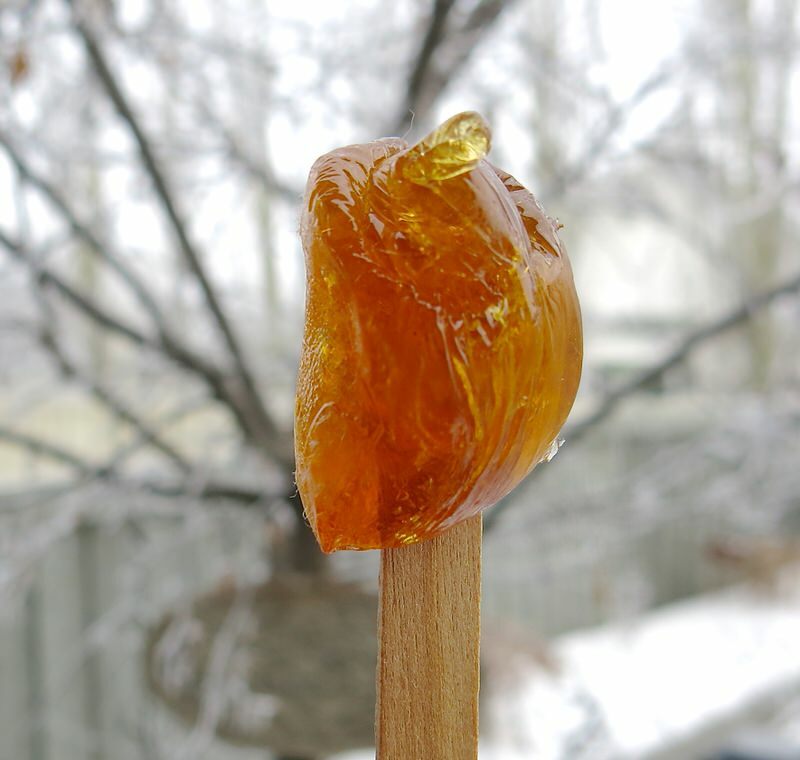 Maple Syrup Taffy Candy is the quintessential Canadian sweet. 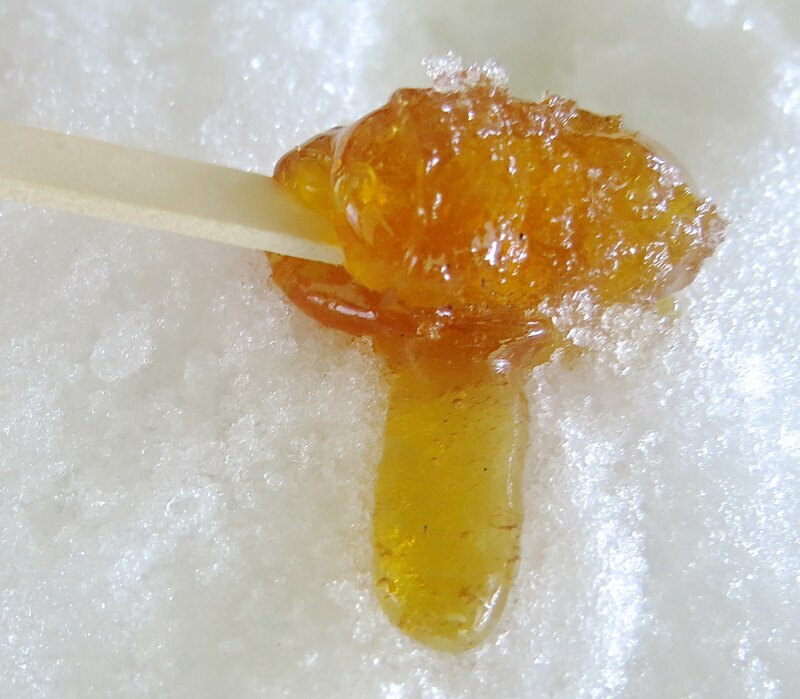 In March of 2010, I visited my first Sugar Shack, or Cabane a Sucre, in Quebec when I was there for the Slow Food National Conference in the Valle de la Batiscan. As it is when attending such conferences, only the best of the best is show cased. Sucrerie Jean-Louis Massicotte et filles, in operation since 1710 still harvesting syrup in the traditional fashion with horse drawn wagons (or via snowshoes) and pouring it into aged oak barrels was the Cabane a Sucre we enjoyed the traditional Sugar Shack lunch at. 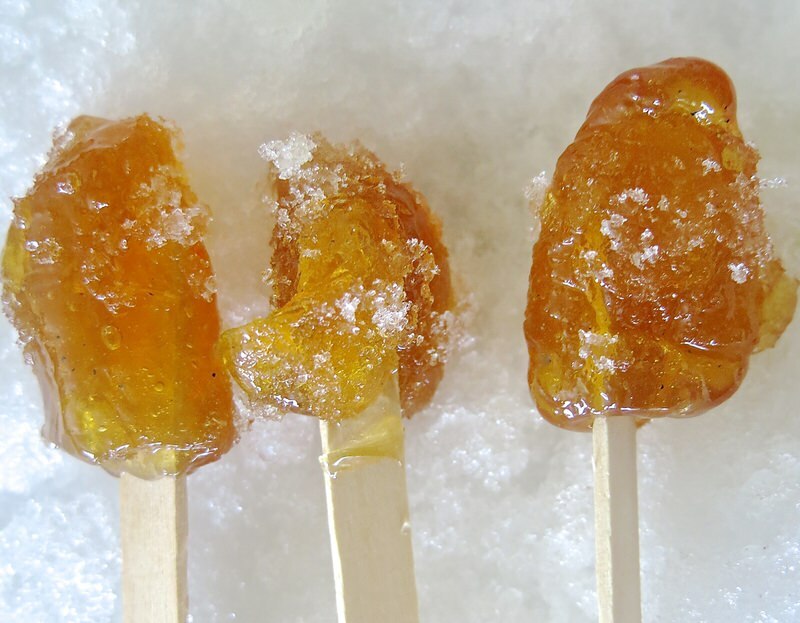 It is in the neighbouring areaof Mauricie, is the oldest traditionally harvested syrup cabane a sucre and listed as one of the 5 best sugar shack experiences in Quebec. The entire experience resonated deep into my Canadian soul and this baptism served as an authentic and missing key into my own cultural identity. 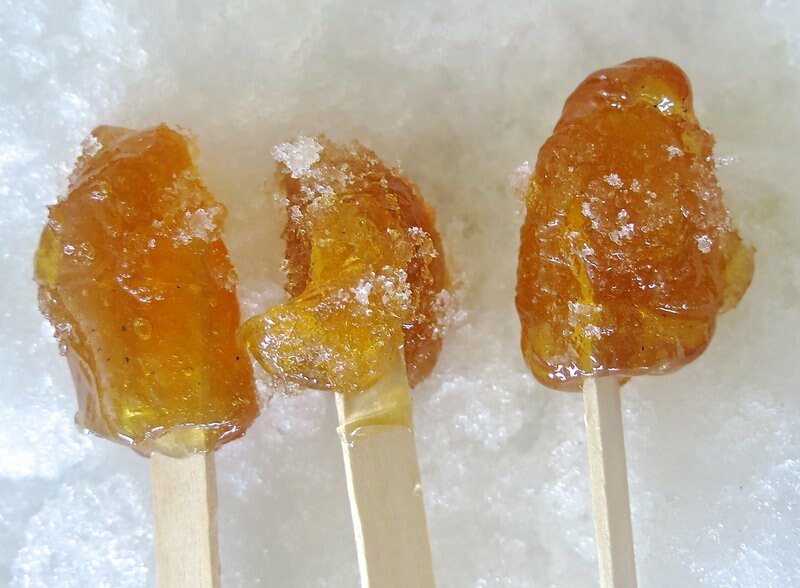 10th generation proprioter Gaétan Massicotte took great pride in pouring his previous boiled maple syrup into a bed of fresh snow outside after the celebratory experience leaving each guest savoring the sweetness of the cold Spring with a stick of Canadian Maple Syrup Taffy Candy. My first. Ever. 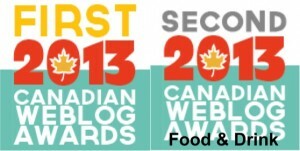 It was such an honor, almost surreal, as yearning to be outside in the snow making Canadian Maple Syrup Taffy Candy as I had seen children do in my grade one Reader in Elementary School had been a deep seated desire. Here I was participating in this ritual this Spring of 2010 no longer with the young body of a child bounding through the snow under leafless Maple trees in the woods as those in my Elementary Reader, yet with the heart of that child revering the sweetness of this water-like sap exponentially distilled into iconic Canadiana. 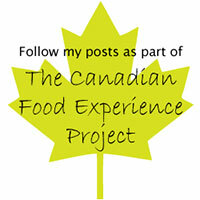 I am Canadian, have been all of my life, and had never had Canadian Maple Syrup Taffy Candy! I had never had poutine until this trip, either. Keep in mind, this was 2010. Poutine as just rearing it’s head out of Quebec and Eastern Canada. 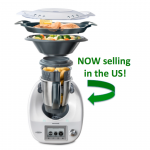 It can now be found in every major Canadian city from coast to coast. Not then. 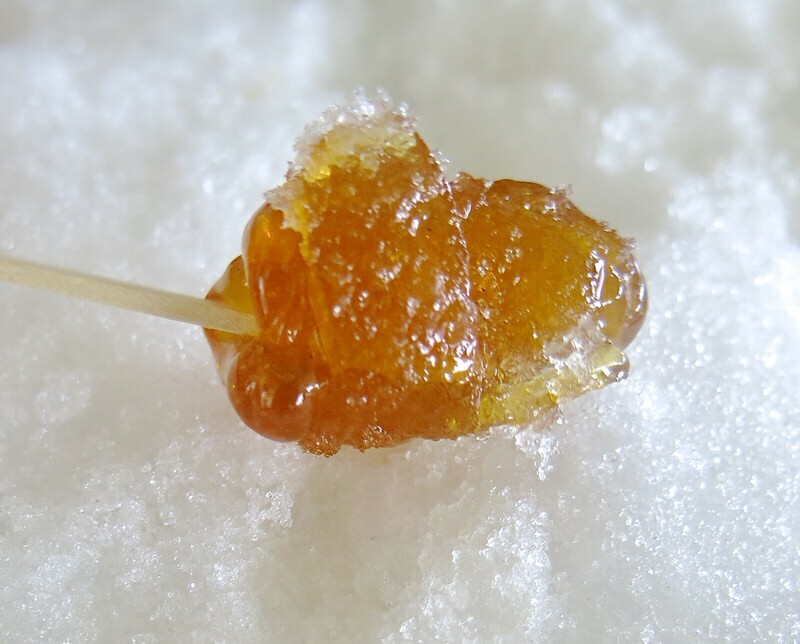 And Maple Syrup Taffy Candy? 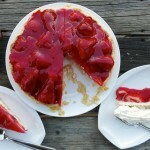 The flavour was reminiscent of a Halloween Taffy Kiss from my childhood. Not the molasses taffy kiss from Kerr’s, but the other one. Possibly the “Original Halloween Kiss” manufactured in Quebec, but as I cannot find the ingredient list anywhere, hard to say that is the one, yet it could well be. 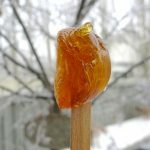 It wasn’t until Brandon from Rolling Desserts connected with me to work with him regarding the launch of his Rolling Desserts Ice Plate that I learned how to make Canadian Maple Syrup Taffy Candy at home. Seriously. 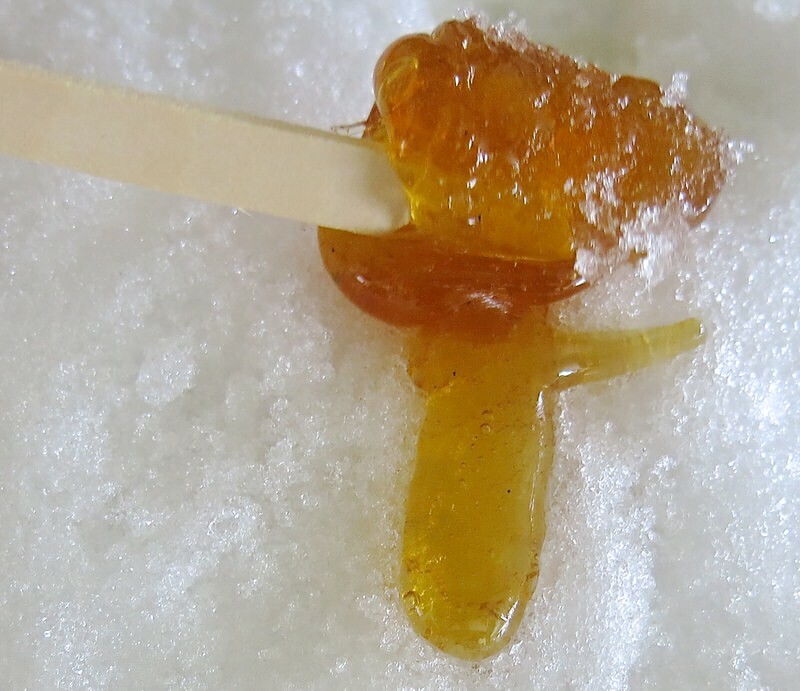 His ice plate makes it possible to make Canadian Maple Syrup Taffy Candy during the summer months, and particularly as celebratory confection for Canada Day! 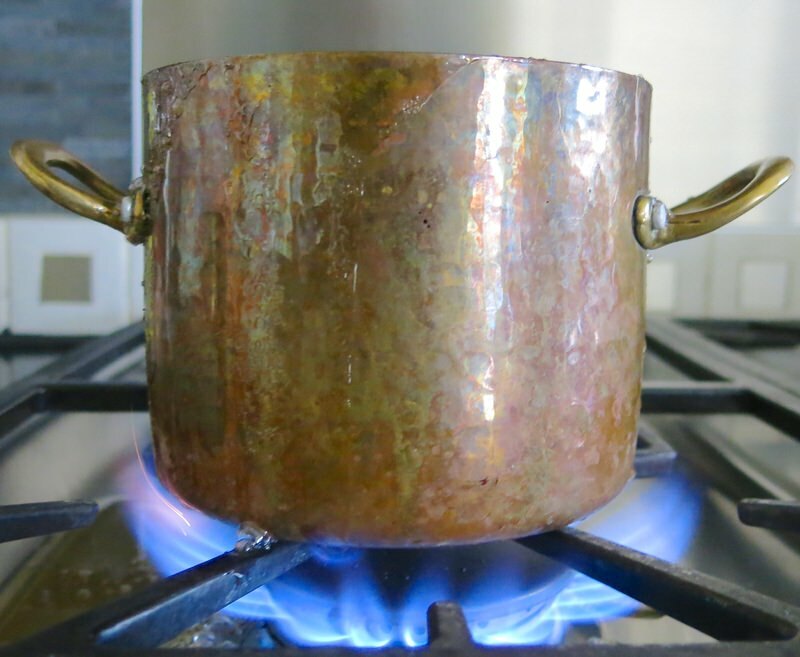 During the process of learning how to make it and practicing for the work I was doing for him, I learned how simple it was to do it anywhere by anyone living in Canada during the winter. 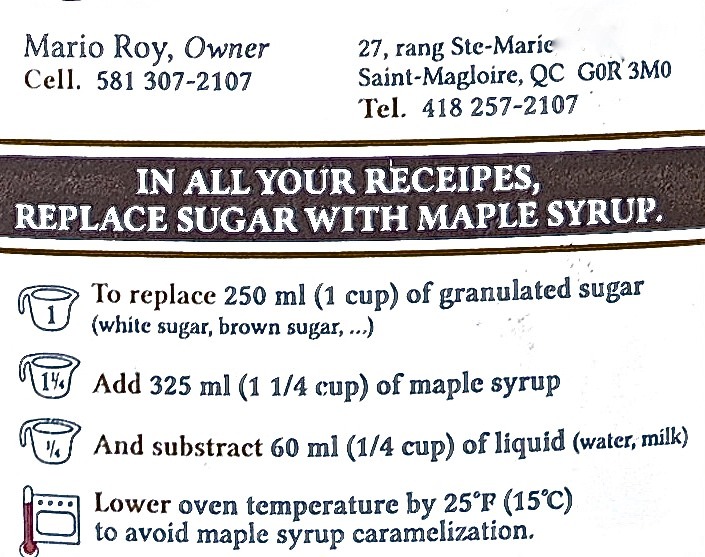 Of course, you have to buy your maple syrup and rarely in the West, do we know a manufacturer personally. 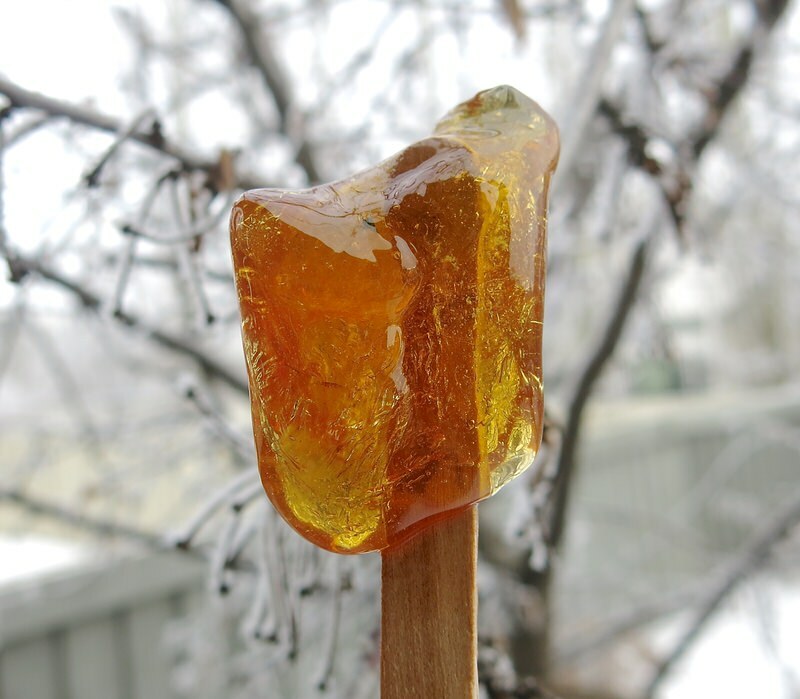 There is a fellow at the Callingwood Market in Edmonton who sells great jugs of the syrup from his parents farm in Quebec and that is what I used to make my homemade Canadian Maple Syrup Taffy Candy! 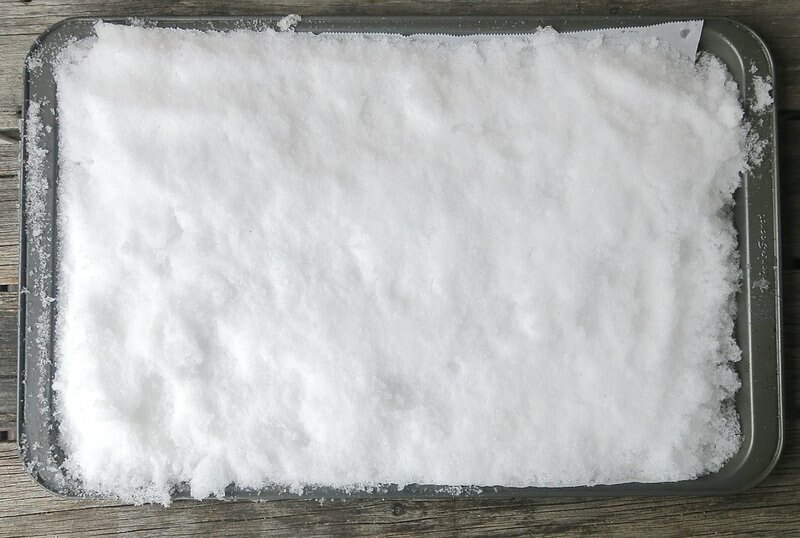 Below, and enlargement from the back of the jug! 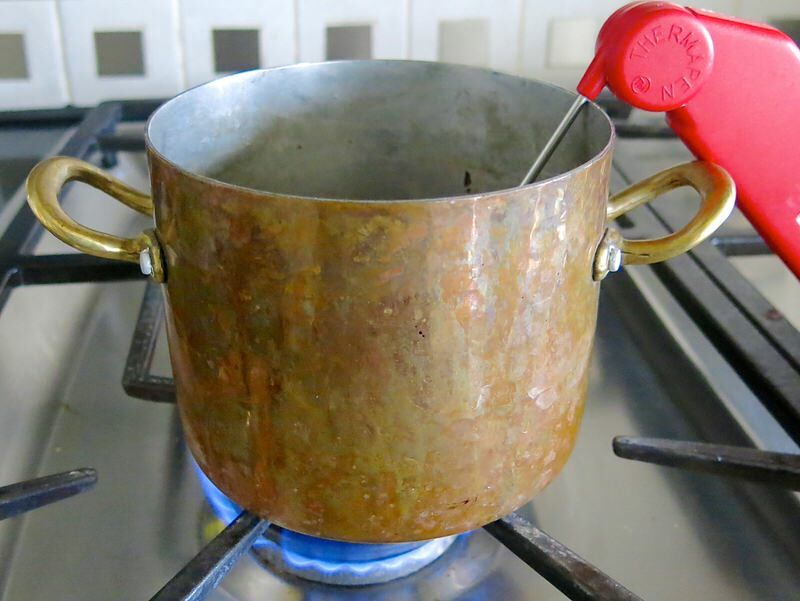 I just so happen to have the perfect little heat conducting copper pot that I indulged myself in a few years ago for caramel making. 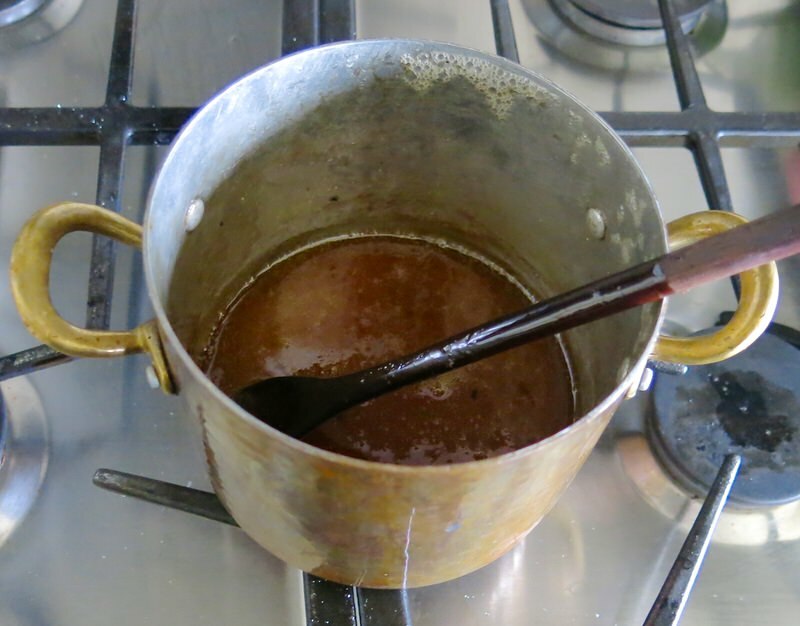 One cup of Syrup will make enough Canadian Maple Syrup Taffy Candy for 8-12 people. 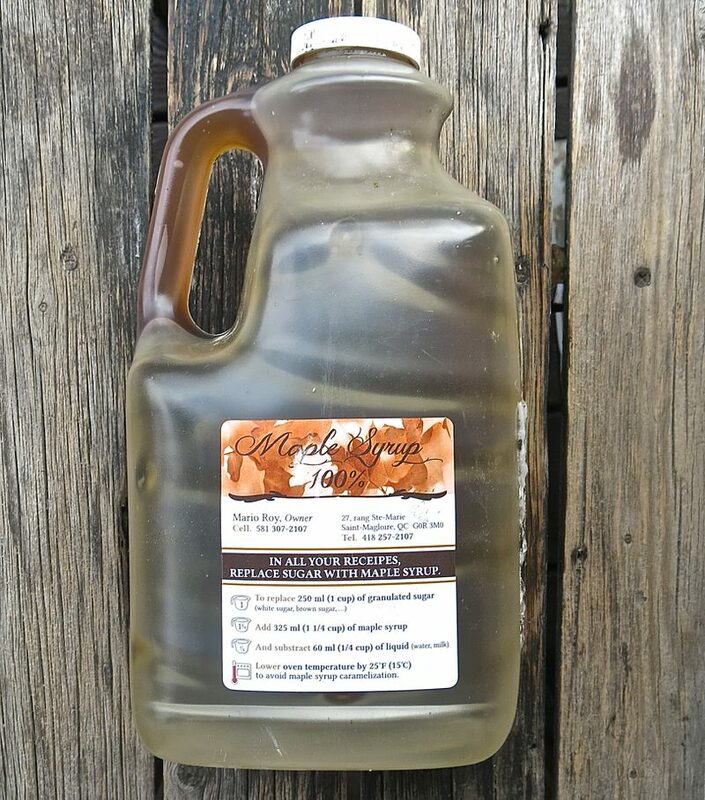 Did you know that one cup of Canadian Maple Syrup takes 40 cups of Canadian Maple Tree Sap? 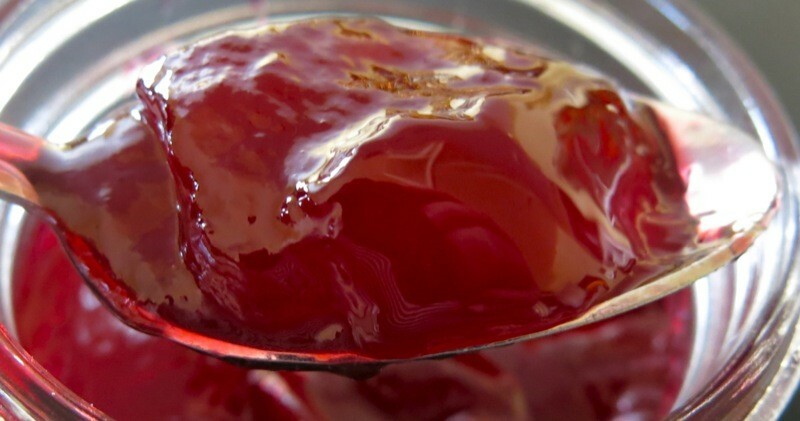 That’s why it is so expensive: it takes 40 gallons of sap to make one gallon of syrup. 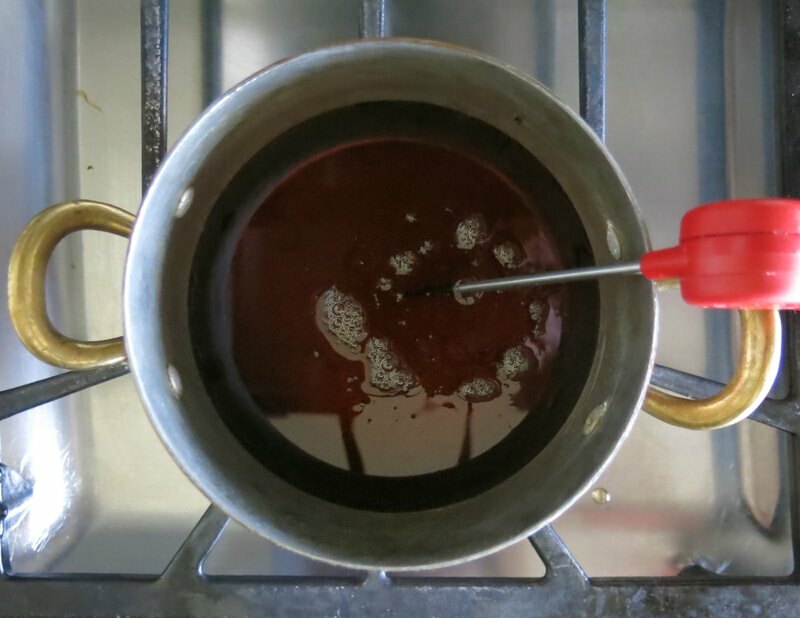 To make the Canadian Maple Syrup Taffy Candy, it is cooked just past the soft ball stage. I never trust any of my candy thermometers. Experience. 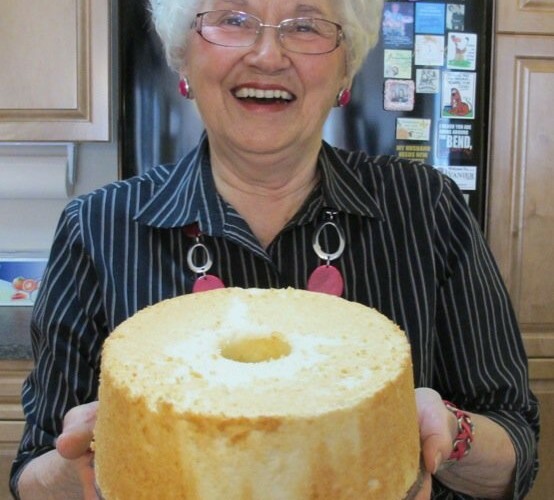 Have had too many recipes go awry due to improperly calibrated thermometers. Who knows how to calibrate a home thermometer? Help? So, I always try to have three on hand. I use 2 and if one falters, have another to rely upon. 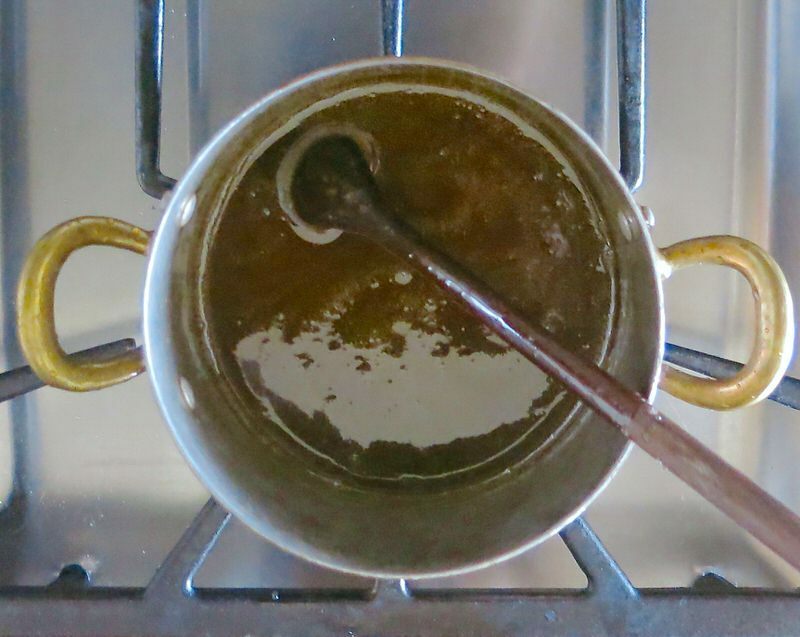 The syrup must boil to 235ºF and though this little pot was less than 1/4 full with one cup of the syrup, it would most definitely boil over (and did the first time) had I not been stirring rigorously. 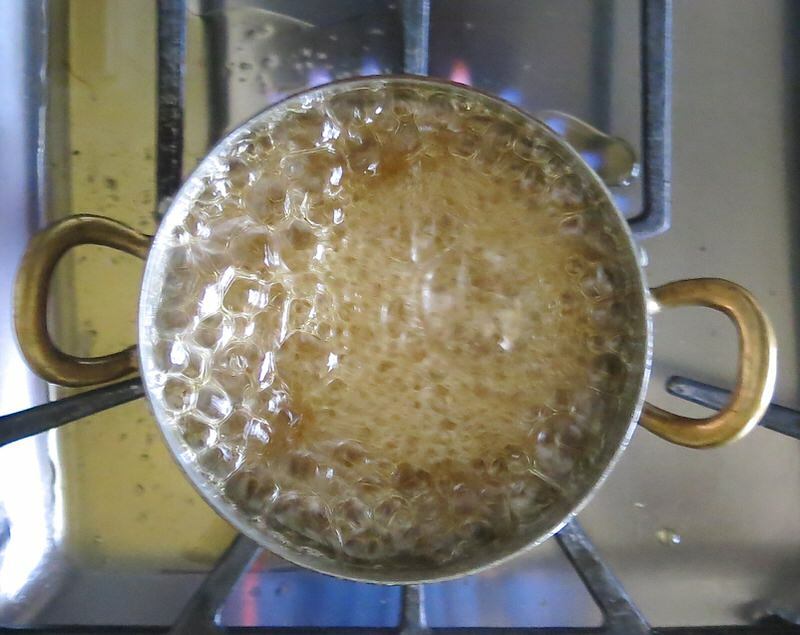 Definitely be sure to stir the boiling pot to avoid more syrup on the stove top than in your pot! 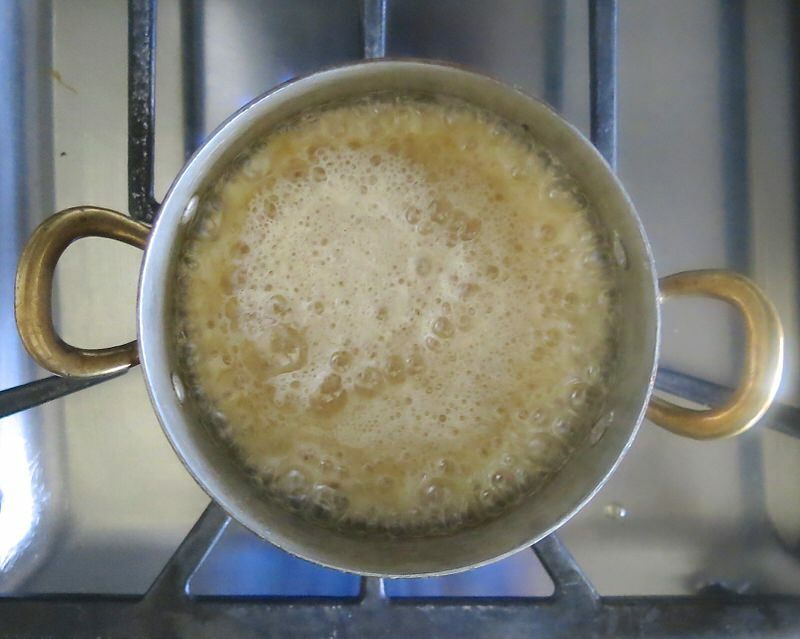 Moderating the heat is important, but the heat must be at medium high to get the syrup to the soft ball stage (235ºF). 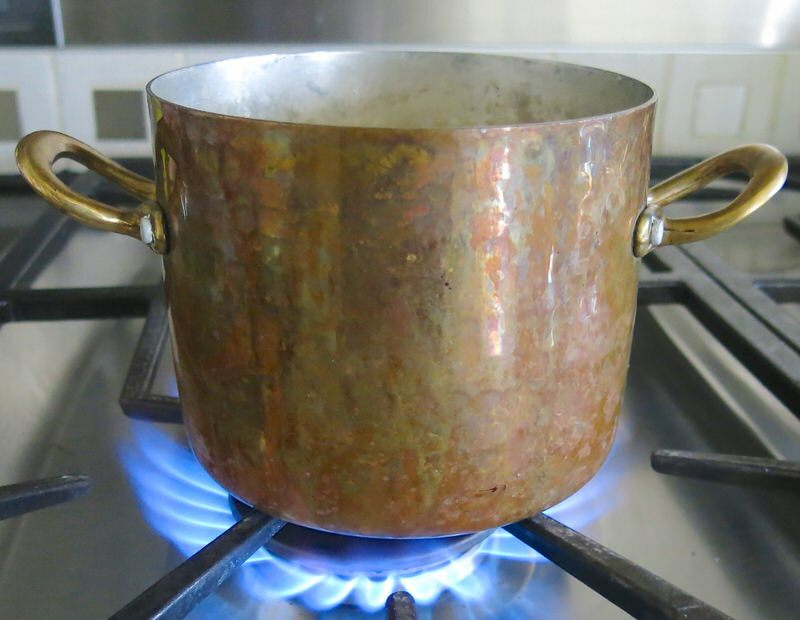 It can literally boil over in the blink of an eye. 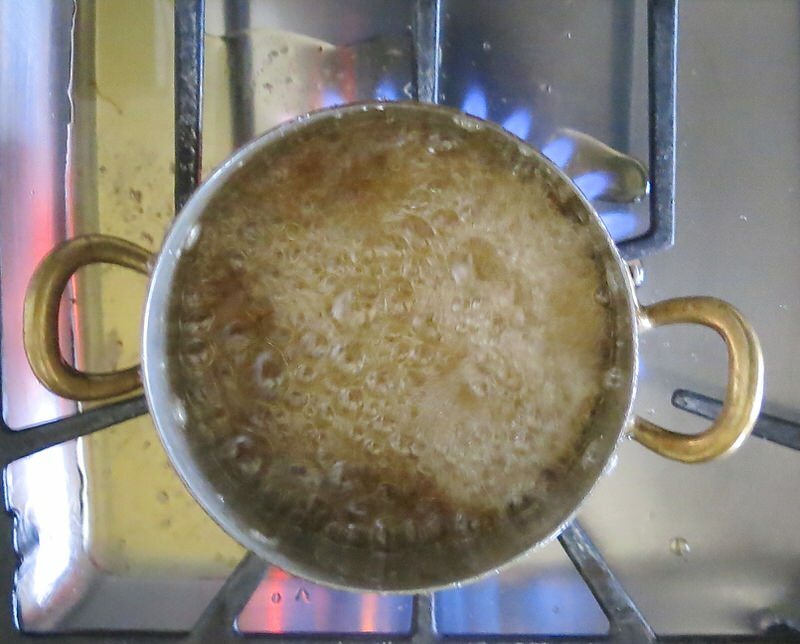 That golden hue on the stove top is not the sunlight. 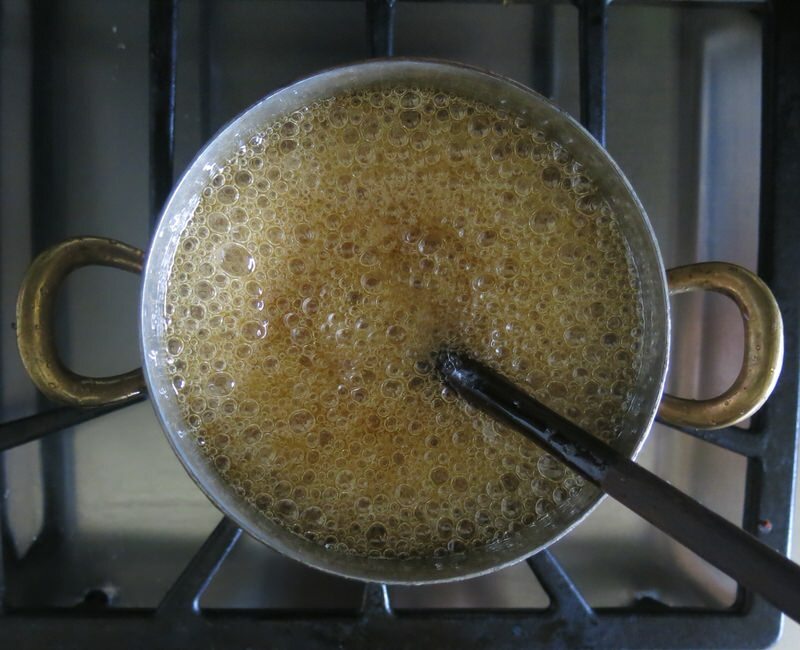 Once the syrup reaches temperature, and it really doesn’t take long when boiling only 1 cup, turn the heat off immediately and set it aside to cool. Bubbles will disappear very quickly. At this point, there is no rush. 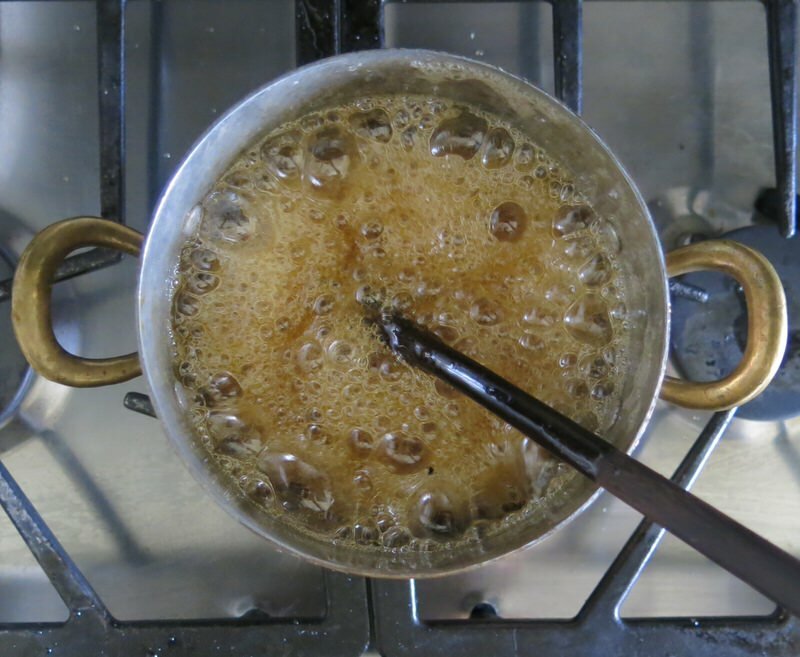 Your syrup is ready to make Canadian Maple Syrup Taffy Candy. How easy is that. I truly had no idea. More to the point, had never investigated the process simply believing it to be too complicated. 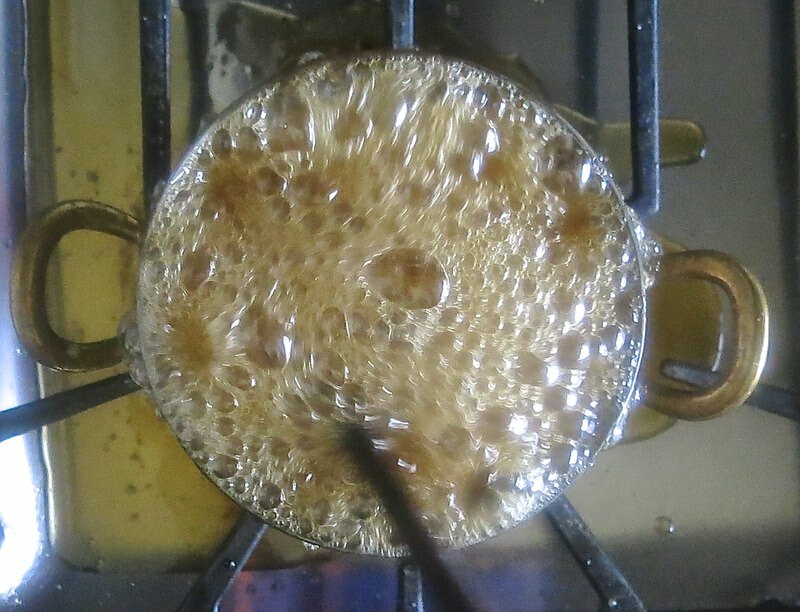 WARNING: This syrup is dangerously hot and can remove skin off your body as it will burn you very badly should there be a mishap. 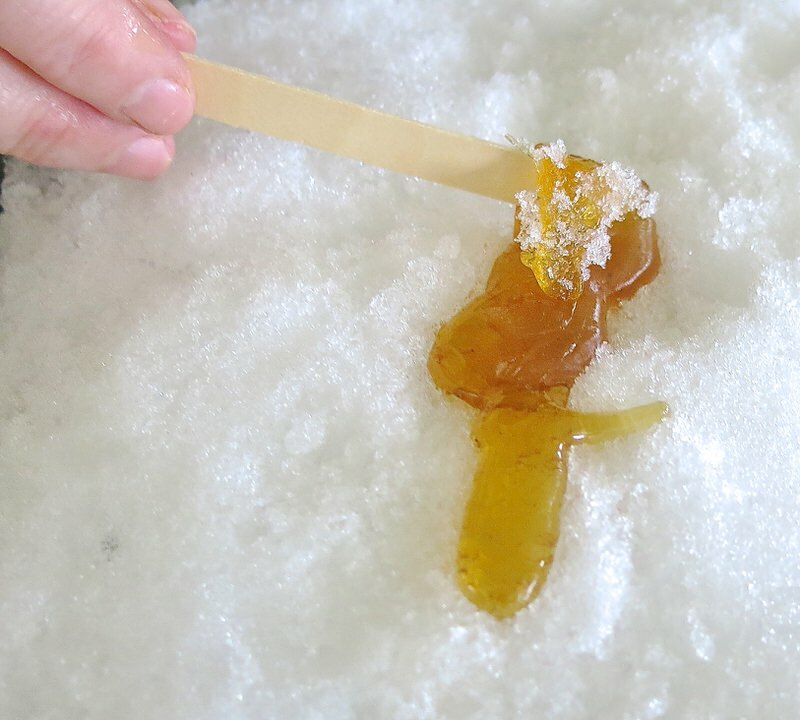 Therefore, best to use protective gloves, explain the danger to any little ones, and have them stand on the other side of the snow from where you are pouring to watch the syrup turn to taffy when it hits the snow. 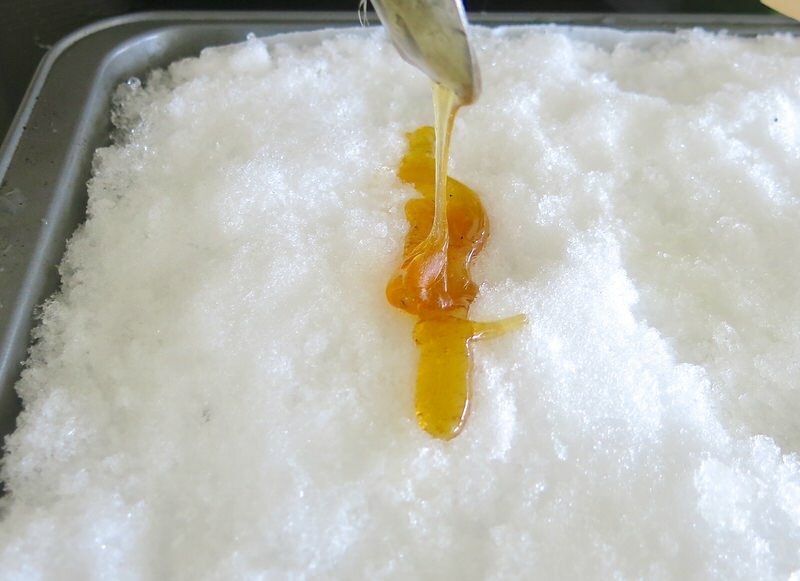 As soon as you pour a thick ribbon of syrup onto the snow, it will start to harden, so quickly demonstrate how to place a stick on it and twist the yet sticky top onto the stick, and roll the taffy up around it. 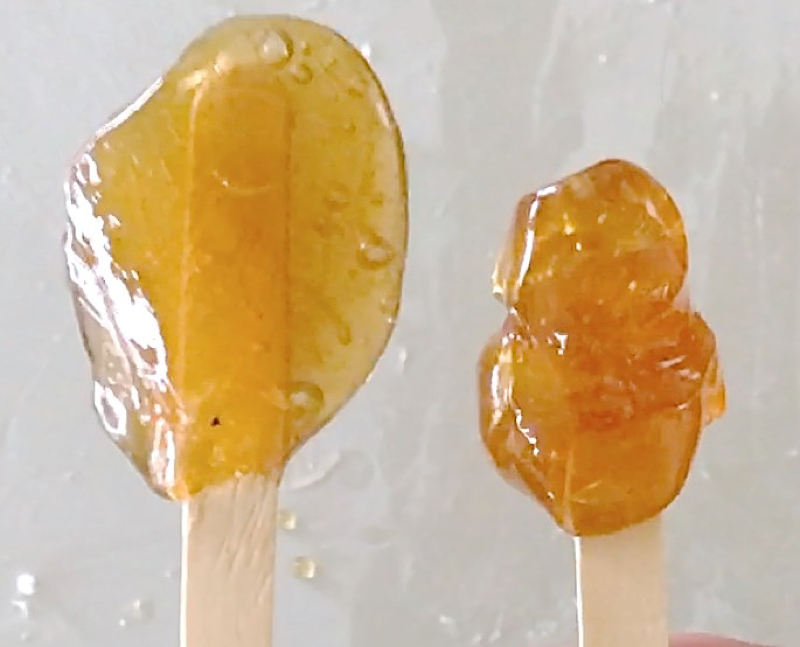 This is the part that must be done rather quickly, or the eager guests will be enjoying flat ribbons of Canadian Maple Syrup Taffy Candy instead of candy pops. In the city, the snow crystals may not add the gorgeous natural freshness to the experience they do in Maple Syrup country. 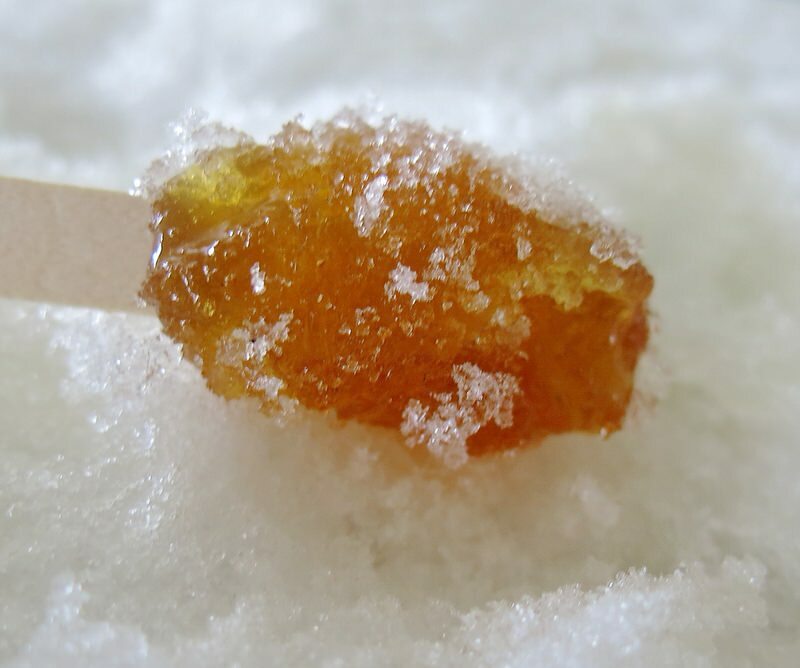 The snow crystals are magic and give way to that fundamental Canadian maple candy flavor that is truly unique when made with real Canadian Maple Syrup. However, do be careful if you are in a heavily polluted area. 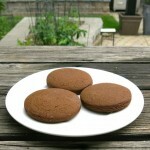 Might be best to rinse them before the first taste, if so. The pleasure is not short lived. 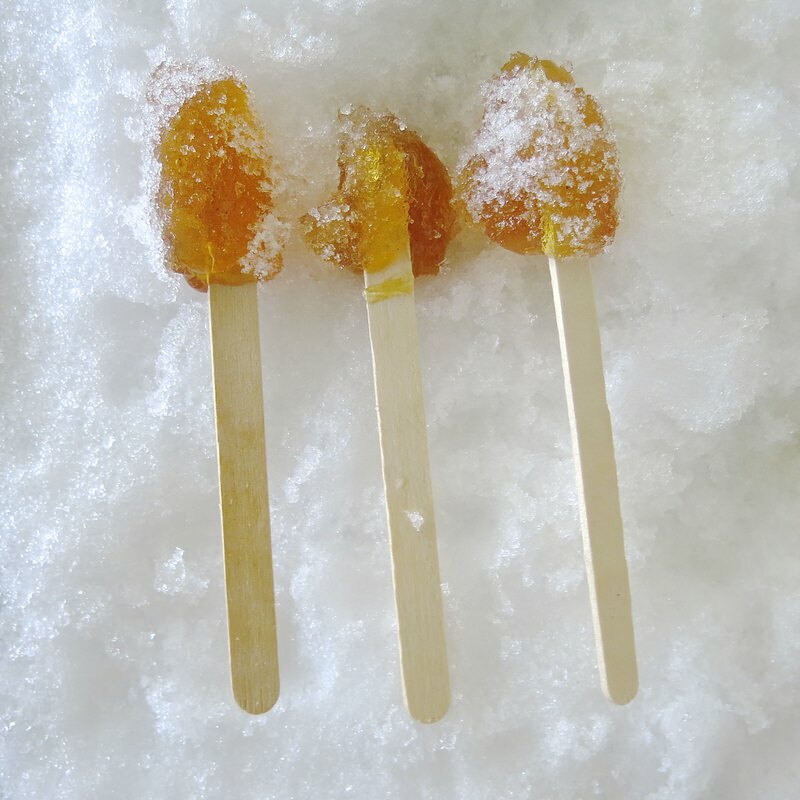 The small little knob of golden taffy will last for a considerable time particularly when outdoors in the cold. 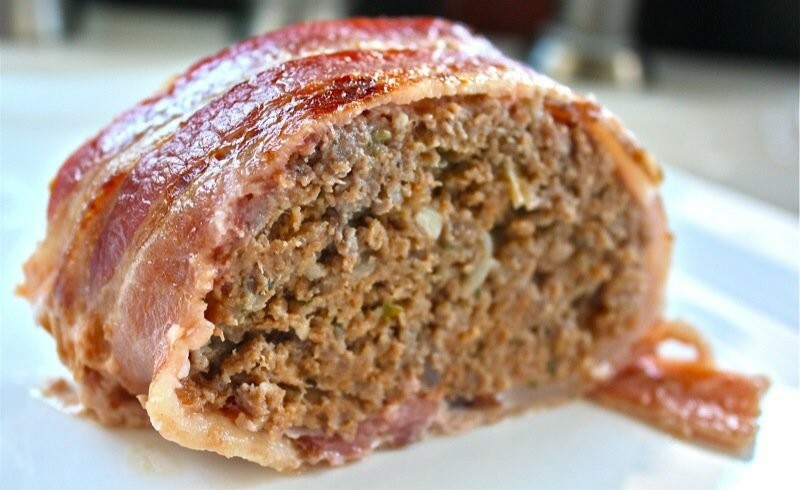 Inside, it has only been boiled to the soft ball stage, so will melt a bit faster and be quite loose within a warm room. How can you beat that? 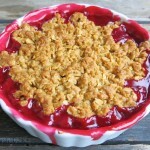 My first experience was life changing and now this bit of Canadiana can be made at home from coast to coast! 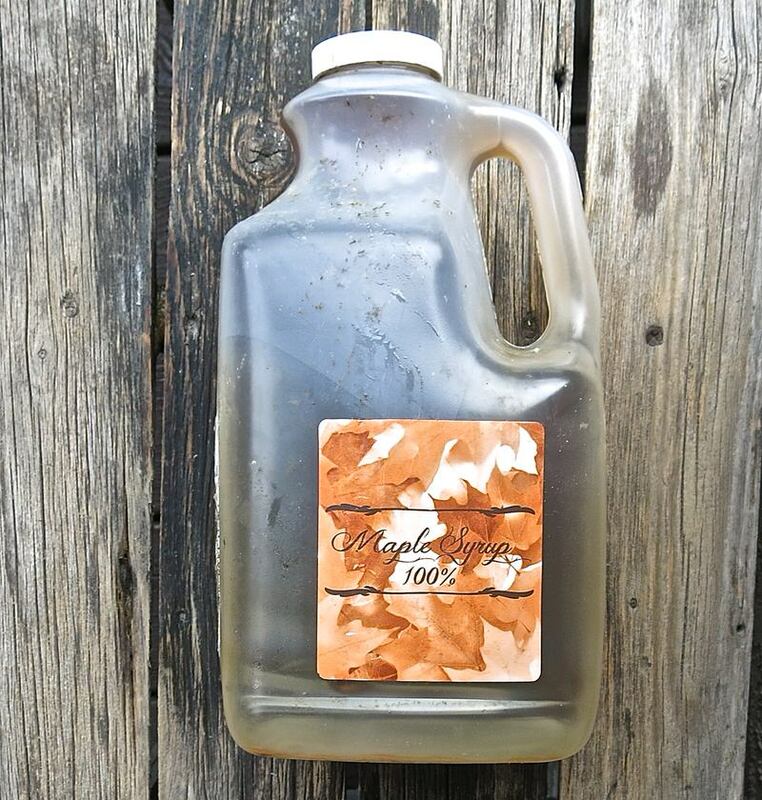 Of course, there will not be the celebratory experience there is in the Spring in the communities that harvest and produce this liquid gold. There will not be the sleigh rides, or the sap sipping straight from the trees… There will not be the comradery or the knowing that comes with such traditions over hundreds of years, but there will be a shared traditional Canadian experience that will harken deep within each and find its way to that cultural core we call home. Ah! Yes. 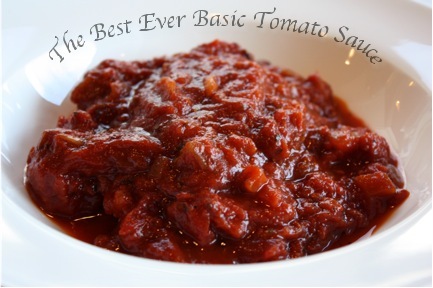 A fundamental taste of our home. Only in Canada you say? Yes, indeed. 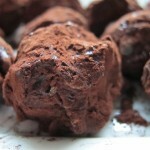 This recipe will only be of good use to you if you have a Rolling Desserts Ice Tray at home, OR if it is Winter and there is a lot of snow outside! ATTENTION: Keep children away from hot taffy when pouring onto cold surface; it is safe temperature only after poured - then work fast! 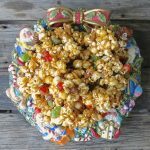 « Gramsy’s Healthy Veggie Muffins: Build Strong Minds and Bodies! Thank you very much! 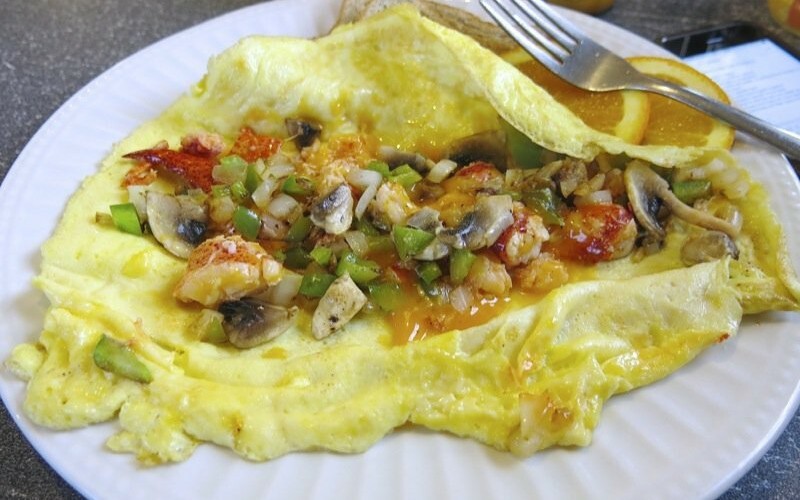 We have been trying at home to do this and it keeps turning rock solid, but your instructions made it perfectly!